Through “Kerakera”, an ancestral tradition, Fakfak communities protect the environment! “We can’t tell you much about this matter. Only a few select people have knowledge about it. You both are too young to know,” Saraf Bairuma from Ugar Village, Fakfak, advised us who were interviewing him about kerakera. Kerakera is a tradition that Fakfak communities implemented to conserve their marine resources and prevent them from being exploited. In other parts of West Papua, this practice is often called sasi. Apparently, the mystery of kerakera tradition has not been completely unraveled. It seems that parts of Fakfak history are still a mystery for most people. Previously when interviewed, Nafaris Gwasgwas, the “Captain” (the King’s Deputy in Fakfak adat) of Andamata Island, Ugar’s neighbor, mentioned; “There are things that we are allowed to tell, there are things that we shouldn’t”. Perhaps this is why not a lot of information about Fakfak traditions are recorded in history books or scientific journals. Kerakera appears to be an original tradition of Fakfak. This tradition bears some resemblance with sasi, which is defined as a community tradition to maintain the sustainability of the natural resources in order to provide benefits for the communities. However, different than sasi, which has been well recorded in various researches, kerakera has only been mentioned in one scientific paper; titled “Trade, Circulation, and Flow in the Indian Ocean World” by Michael Pearson. Despite the warning, Saraf Biaruma and his brother, Ahmad Biaruma, as important stakeholders in Ugar village were still generous enough to share the story of kerakera system that is still operating in Ugar today. Kerakera in Ugar is a form of collective agreement that binds all villagers to not harvest certain natural resources, both on land or in the ocean, during a specific period of time. This means that residents who live outside the kerakera area must also respect the ongoing moratorium agreement and are not allowed to harvest or take the protected natural resources. Saraf Biaruma explained that the communal part is what makes kerakera different from individual sasi. Kerakera in the ocean takes form in a ban on harvesting shrimp, sea cucumber, and lobster in an area of one hectare in width. Kerakera on land is marked by leaf symbols on selected trees. These marks ban taking the tree’s fruits; the ocean kerakera does not use symbols to mark the territory. “The kerakera location is identified by looking at two islands that border the area. Usually the locals here know where they are,” added Saraf. Kerakera is carried out regularly and the locals are accustomed to its rules. The closure of the area is conducted between October-April, and it opens during April-October. The opening of kerakera usually falls in March or April with a unique ritual. “We usually decide the time of the “opening” ritual by the signs from birds, the sun, and water condition,” Saraf mentioned, but he hesitated to elaborate further about the details. “Come and witness yourself the upcoming ceremony in March or April 2019 to fully understand the process,” he continued. Perhaps, this is one of the details that are prohibited from being shared to people outside the respected elders in Ugar. He then proceeded to explain that the ritual usually occurred for 2-3 days. 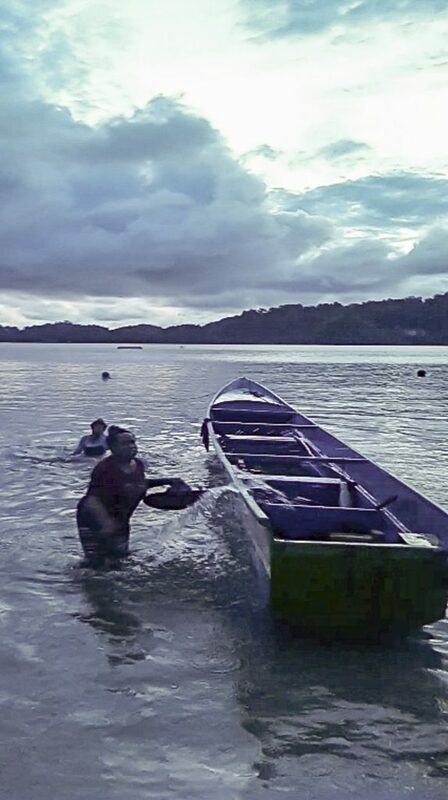 One day before the kerakera opens, all residents are informed, as well as other residents outside of Ugar, such as in Kokas area, so they can prepare themselves to do the swimming ritual that is believed to cast away bad luck. This is practiced prior to the opening of kerakera. Although plenty of residents outside of Ugar participate in this tradition, Saraf confirmed that the ritual still takes place on Ugar Island. 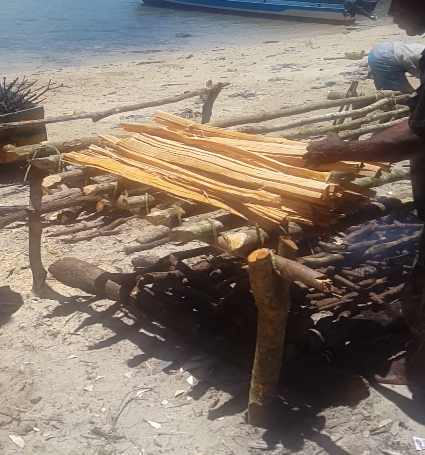 Why are Ugar residents still carrying on this tradition while residents in other Fakfak islands have stopped doing it? He only shrugged. It is known that the Ugar ancestors were strict in practicing kerakera and highlighting it as a responsibility for the future generations to continue the tradition. Therefore the tradition still exists today. He mentioned that in Ugar, children are involved so that the future generation is aware of the ritual and are able to continue its practice. Adding to the mystical side of the tradition, both Saraf and Ahmad Biaruma believe that the punishment for offenders takes form as “magic.”. Usually, the perpetrators who take forbidden species during kerakera closure suffer with various illnesses. This belief might be a contributing factor to people’s obedience towards kerakera. Whether true or not, one thing for sure is that this tradition in Fakfak, especially Ugar, is proof of a how local wisdom works in protecting nature and it is hoped that it will inspire other villages in Fakfak to revive this dying tradition.